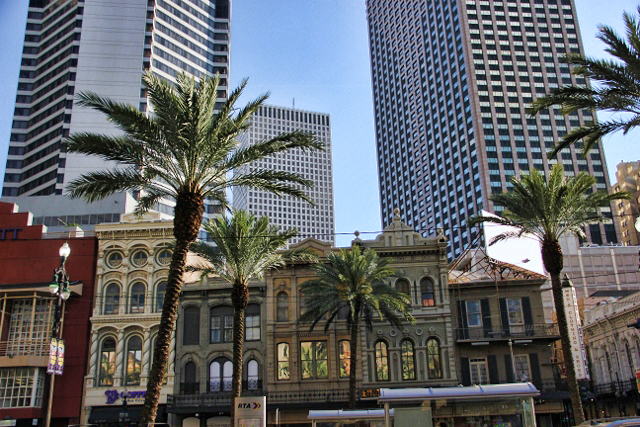 I loved this cityscape in New Orleans. I loved the quaint and beautiful architecture of the old world charm of New Orleans and the skyscraper glass buildings of the new world. The contrast is interesting, don’t you think? And the added palm trees give it a tropical feel. I love photographing things. I never know what intriguing things I will capture when I’m least expecting it. Like the rainbow yesterday! Ever take a picture and are thrilled you captured something you least expected–in a good way??? ← A Rainbow in New Orleans? What a great picture of blending old with the new!